With our fully accessible wide beam boat, Crusader Community Boating specialises in boat trips for disabled people of any age as well as elderly people in care homes. There is no charge for people from Northamptonshire. The service is run by fully trained crew volunteers and funded through voluntary donations. For the majority of our passengers, the ability to come on our specially equipped boat, along with their carers, provides them with social and leisure opportunities they might well otherwise be denied. We hope this contributes, in some small way, to their social welfare, countering a feeling of isolation many often experience. Most trips are booked up through a support organisation serving people with physical and/or mental disabilities and care homes. We are able to offer a limited number of places for disabled people who aren’t associated with any particular support organisation. Each disabled person can bring up to two carers with them. Private Charter Trips can also be arranged for anyone looking for an interesting day out for a party of up to 20 people. These trips are chargeable and are run to help cover the overhead costs of our service for disabled people. 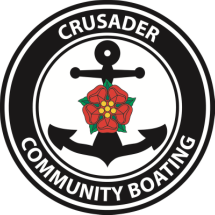 Please support Crusader Community Boating - it won't cost you a penny!